Your webpage has 2 'img' tags and 1 of them are missing the required 'alt' attribute. Your webpage is using 12 inline CSS styles! Congratulations! Your website is using the latest version of Google Analytics. We've found a favicon in your page's HTML code, but it's not accessible. To add a favicon to your site, you need to have your logo created in a 16x16 PNG, GIF or ICO image and uploaded to your web server. The size of your web page's HTML is 76.51 Kb, and is over the average web page's HTML size of 33 Kb. You should compress your HTML to reduce your page size and page loading times - this will help your site retain visitors and increase page views. If you were using compression, you could be compressing your HTML size by 87 % - from 76.51 Kb to 9.90 Kb which would further reduce your page loading time. Your site loading time is around 4.352 seconds and this is under the average loading speed which is 5 seconds. Congratulations! Your webpage use 'Expires' header for your images and the browsers will display these images from the cache. 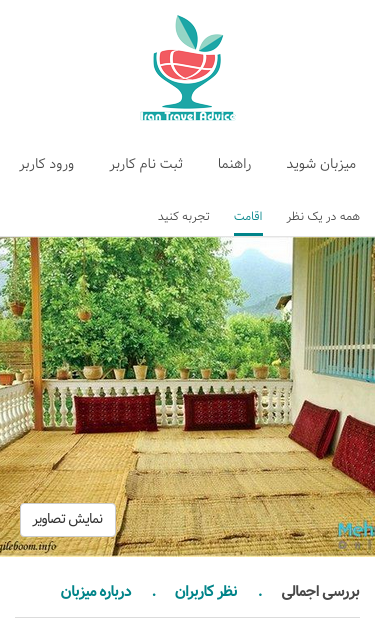 https://www.irantraveladvice.com/fa/p/home/32056799 and https://irantraveladvice.com/fa/p/home/32056799 should resolve to the same URL, but currently do not.